Aussie, Aussie, Aussie! Oi, Oi, Oi! This is the chant you will hear all over Australia on the 26th January, the official national day of Australia. Commemorating the 1788 landing of the first fleet at Sydney Cove. 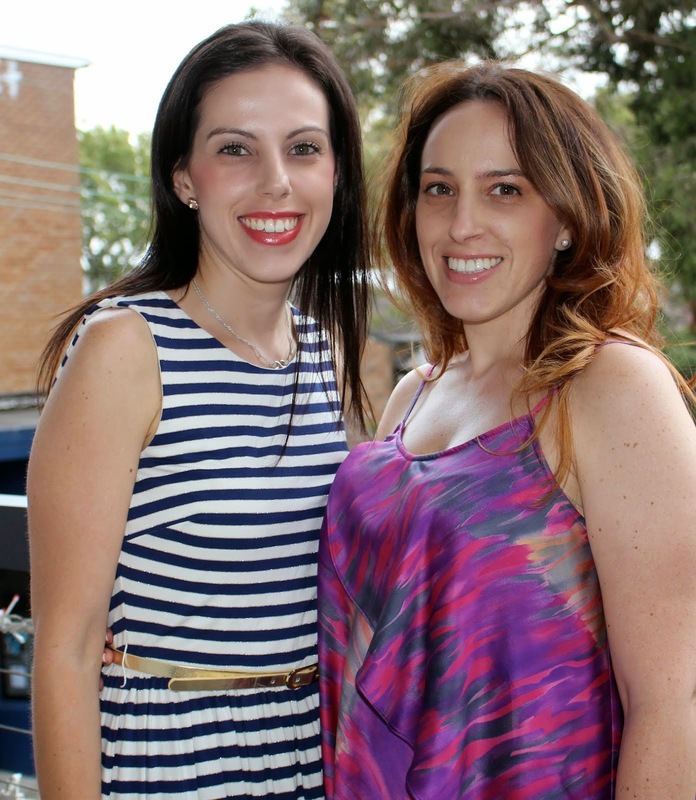 Australia Day is a day to celebrate with friends and family. Wether it’s celebrated with a game of cricket in the backyard, a picnic at the beach, or a good old Aussie BBQ! On a hot, summers day there is nothing better than sitting back and relaxing, with a beer in hand (the gluten free kind!) and some fair dinkum Aussie tucker, listening to the tunes of triple J's Hottest 100 Countdown. 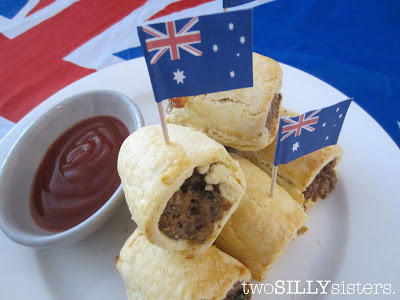 So in True Blue Aussie style here is our version of gluten free Aussie Sausage Rolls. Happy Australia Day everyone and let’s hope there are not too many sore heads on Friday morning! 2. Combine mince, breadcrumbs, cheese, parsley, garlic and egg in a bowl. Gradually add the water, a handful at a time, until it forms a wet mixture. Set aside. 3. For the pastry, empty contents of Orgran Pizza & Pastry mulitimix into a large bowl and add a pinch of salt. Mix. Rub butter into the flour mixture with your fingertips, until it resembles a fine crumb. 4. Whisk egg and water in a separate bowl and add to dry ingredients. 5. Mix together with a fork until the pastry comes together and then form into a ball with your hands. 6. Knead gently on a floured surface for a few minutes before rolling out. 7. Divide dough in half. To prevent sticking place dough on floured baking paper and roll out 1cm thick with a rolling pin (flour rolling pin to prevent sticking). Continue rolling until it forms approximately a 25cm square. Trim edges with a knife to form a clean square. Note: Pastry is very crumbly so be careful while rolling and work quickly or pastry will dry out and crumble further. 8. Shape a handful of mince mixture into a sausage shape. Place along one side of pastry. Using the baking paper, carefully roll the pastry around the sausage until the edges meet, leaving enough space for pastry to overlap 1cm. 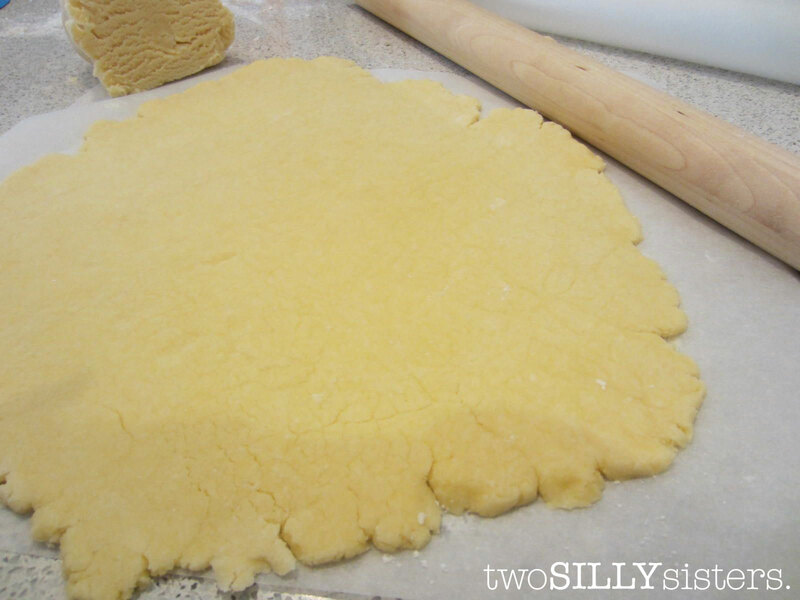 Trim excess pastry and add to remaining dough. 9. Brush edge of pastry with egg white and press firmly in place to seal. Cut log into 3 pieces (cut into smaller or bigger pieces depending on size you want your sausage rolls). Place on prepared trays and repeat with remaining pastry dough and mince mixture. 10. 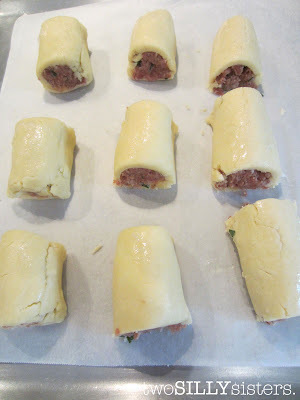 Brush tops of sausage rolls with egg white. Bake for 25-30 minutes or until golden and cooked through. Serve with tomato sauce. 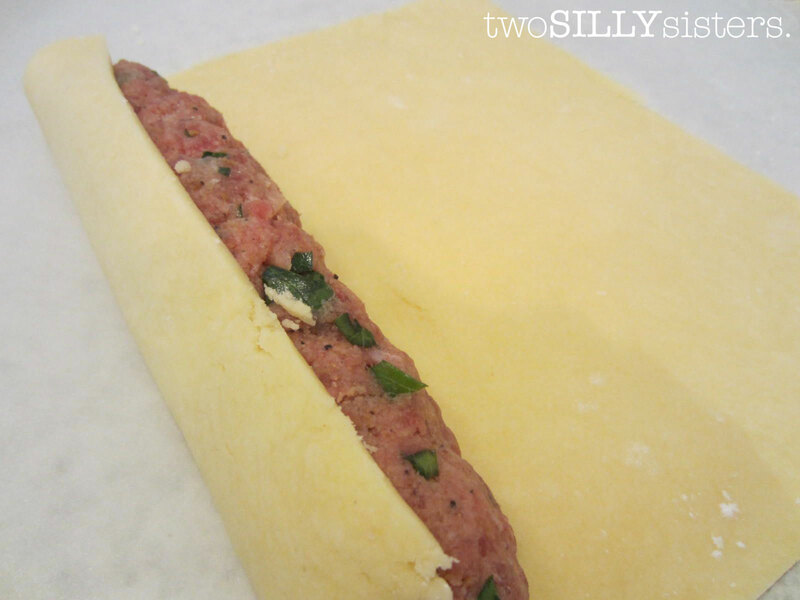 Makes approximately 12 sausage rolls (depending on size of pieces cut). *TIP: If you prefer, you can buy pre-made pastry sheets. Try the Pastry Pantry. If you have left over mince mixture, roll into balls and fry. These will make tasty meatballs!